Fulton Fire Chief David Eiffe and Department Chaplain Fr. John Canarro lead the remembrance ceremony. Members of Fulton Fire Department and Fulton Police Department attend the remembrance ceremony for two fallen Fulton firefighters. Members of duty shift lower the flag. Members of the Fulton Fire Department stand as the flag is lowered. Chief Eiffe shares the line of duty deaths of firefighters Floyd Adel and Leon Hammond. Fulton Fire Department retirees place the wreath in honor of fallen Fulton firefigthers Adel and Hammond. 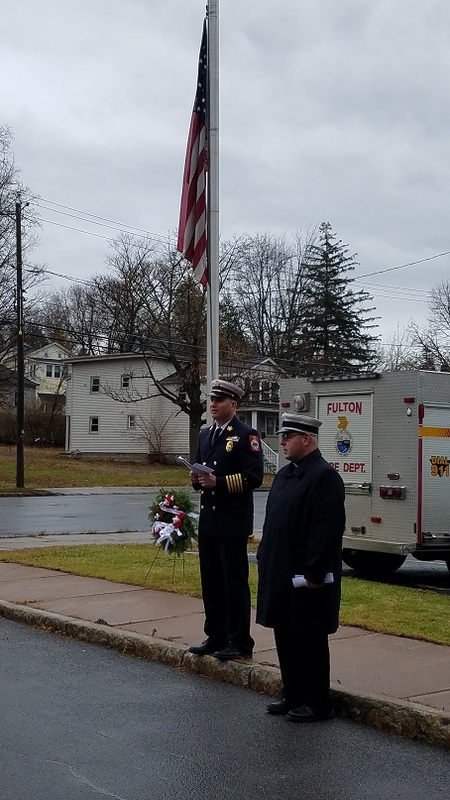 FULTON, NY – Just over 100 years after their line of duty deaths, Fulton Fire Chief David Eiffe honored two of Fulton’s fallen firefighters, Floyd L. Adel and Leon J. Hammond. Today, Eiffe strives to remember all four of Fulton’s former firefighters whose names are on the NYS Fallen Firefighters Memorial Wall in Albany that lost their lives in service at some point in the department’s 115 years of service. Fulton Fire Department lost firefighters Adel and Hammond almost exactly one year apart, a rough year in department history, Chief Eiffe said. As both line of duty death anniversaries approached, Chief Eiffe and the Fulton Fire Department organized a remembrance ceremony to be held in their honor. “If it were to occur here today, I hope they would do this to remember us 100 years from now,” Chief Eiffe said. On December 4, 1914, at just 31-years-old, firefighter Floyd Adel faced his untimely death when he came in contact with 2300 volts of electricity as he was sent aloft to attach a bracket while installing a new fire alarm box for the Nestle Food Company at South Fourth and Fay streets. Firefighter Adel was assisting Assistant Chief Elsworth Rude, who was later killed in the line of duty and was honored by current members of the Fulton Fire Department earlier this year. Adel’s death was instant but his legacy lived on through department history as he is known even still as “a jack of all trades,” having often been called upon many times to perform various projects. “Firefighter Adel was said to possessed the true instinct of nature’s gentlemen, that of kindness and helpfulness towards all with whom he met,” as read in the remembrance ceremony program. Adel left behind a young wife. Nearly a year to the day of Adel’s death, Fulton firefighter Lean J. Hammond died in service on November 30, 1915. While operating at the scene of a freight house building fire near North Third and Oneida streets, firefighter Hammond was caught under falling blocks when the south wall of the freight building gave way, burying him under five to six tons of concrete. As Hammond and the two other firefighters stationed inside the doorway of the south wall, firefighters Barto and Quirk, heard the wall above their head crack, they each made an attempt to escape the building. Firefighter Barto ran inside the building, firefighter Quirk ran out, and firefighter Hammond started west before he was crushed by the falling blocks. Though it was reported he was barely breathing when extricated from the pile of concrete, he was pronounced deceased by the time doctors arrived on scene. At 37-years-old, Barto was survived by a wife and son. Fire Chief Eiffe recalled the stories of these former Fulton firefighters to a group composed of members of Fulton’s city government, Fulton Police Department, current and retired Fulton Fire, and Oswego Fire Department. Retirees of Fulton Fire Department placed a wreath in honor of firefighter Adel and Hammond as members of duty shift lowered the flag. All observed a moment of silence as the “Striking of the Four Fives” was performed, a rich tradition in fire service rendering final honors to departed comrades. The ceremony was closed in prayer, with Department Chaplain Frather John Canarro reminding all to appreciate the gift of life each day as it may be the last and to use the ceremony honoring firefighters Adel and Hammond as a reminder to cherish the gift of life.